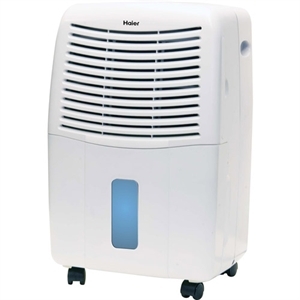 The Haier 32 Pint Dehumidifier is perfect for reducing excess moisture in the air that takes away from your home. The Haier 32 Pint Dehumidifier is perfect for reducing the excess moisture in the air that takes away from your home comfort and can damage everything from electronics to books and clothing. This dehumidifier extracts moisture from the air and gathers it in the large, front access collection bucket.